Cars on Interstate 95 zoom past a speed limit sign just north of Old Town. The speed limit on the stretch of road North of Old Town will soon be raised to 75 mph. 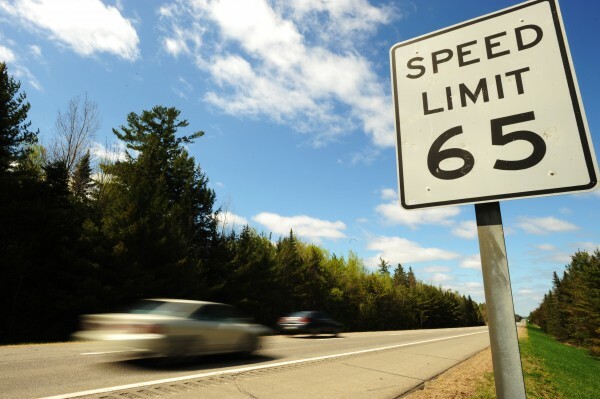 AUGUSTA, Maine — Motorists driving along Interstate 95 between Old Town and Houlton will see more than just trees next week, as the Maine Department of Transportation posts new signs to signify a 10 mph increase in the speed limit. Mark Latti, spokesman for the MDOT, said Monday evening that the old signs with the 65 mph limit will be taken down and replaced so that motorists know that they can now go 75 mph on that stretch. The decision came after Rep. Alexander Willette, R-Mapleton, sponsored a bill to allow the state’s transportation commissioner to bump up the speed limit on Maine’s northernmost stretch of the interstate. It also gave DOT Commissioner David Bernhardt the discretion to keep the 65 mph limit on stretches of the highway where higher speeds could pose a danger, such as near the relatively few exits or in areas with high rates of vehicle-animal collisions. Latti said that the entire stretch likely will be posted at 75 mph. Willette and bill supporters said the change merely reflects the reality that many drivers already exceed 65 mph on the roughly 100-mile stretch of I-95 north of Old Town. Rep. Charles Kenneth Theriault, D-Madawaska, said allowing drivers to legally cruise at 75 mph would also help businesses move goods faster and tourists reach their destinations more quickly. A 1999 Maine Department of Transportation study showed that most drivers already were driving up to 75 mph between Old Town and Houlton. The MDOT supported the change and testified that the department could absorb the loss of revenues from fewer speeding tickets. Under federal law, states are given considerable discretion to set speed limits on interstate highways, although that was not always the case. Between 1959 and 1973, the maximum speed on I-95 was 70 mph. In 1974, speed limits were lowered nationwide to 55 mph in response to the 1973 oil crisis. Congress lifted the federal speed limit controls in 1995.